The Skate is a new universal buggy platform for carrying a second child. It enables you to transport your child comfortably and effortlessly on the pushchair. 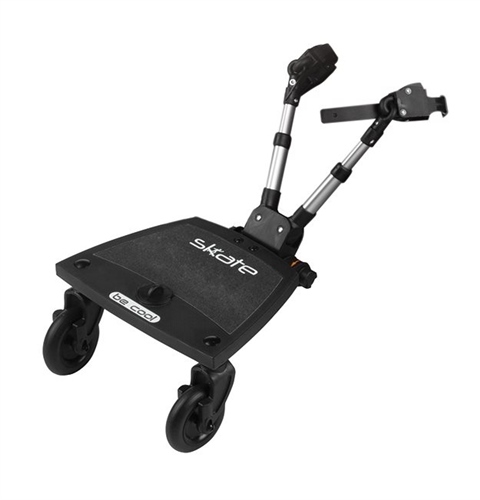 It’s a buggy platform that can carry the child standing up or sitting down with the optional Skate Seat unit. A practical and convenient product that can be attached to the rear part of most of prams, strollers and buggies. The PLATFORM is equipped with an adjustable strap that lets you store it away when it is not in use. Optional Skate Seat unit turns this platform into an exciting ride for your child. The Skate is a universal buggy platform that fits most prams, strollers and buggies on the market. Bugaboo Cameleon 3, Buffalo and Bee 3.